This entry was posted in "Four legs good", Not a Review, Single Note Exploration and tagged Champs Elysees, Dawn Spencer Hurwitz, Dominique Ropion, DSH Perfumes, Frederic Malle, Guerlain, Jacques Guerlain, Jean-Paul Guerlain, Mimosa, Tiare Mimosa, Une Fleur de Cassie. Bookmark the permalink. Well, speaking of purgatory…Mimosa is my holy grail of natural smells, and I’ve been obsessing over it (and how to get it in a bottle) for ages. I love reading about mimosa, and have tried all of the above. Mine is a long story, so I’ll cut to the chase: like you, I’ve decided that blends work better than soliflores to satisfy my mimosa needs. Une Fleur de Cassie is so far the best for me. One of the difficulties I’ve encountered is not knowing what variety I’ve smelled and loved. I think it is acacia farnesiana ( so I’ve been told, at lead). But I can’t be sure. And apparently of these there are sub varieties. Cheryl, if you look closely at the second picture, you’ll see that those two twigs are from different varieties. Mimosa on the first picture looks more like the one I used to love. Now I’ll have to wait another year and go smell both. Undina,the one is the first picture looks like the one that got me hooked, too. I’m going to be able to re-smell it soon. Can’t wait! I don’t think I’d be very good with mimosa perfumes because of the almond aspect but I’m sure I’d like it in its natural setting. That’s such a good discovery you made about your recollection of the whole tree vs. the absolute. That explains a lot. The sound of Une Fleur de Cassie scares me a bit but I think it’s one of those perfumes you need to try. Rusty in a perfect pose once again! Thank you, Tara. I told Rusty his imput was appreciated. You should definitely try Une Fleur de Cassie – you might like it after all. Because here in the northeast US, people identify a certain tree with pink fuzzy flowers as mimosa trees, when I first began writing about perfume I associated mimosa with that flower, which has sort of a moist cucumber-like smell. 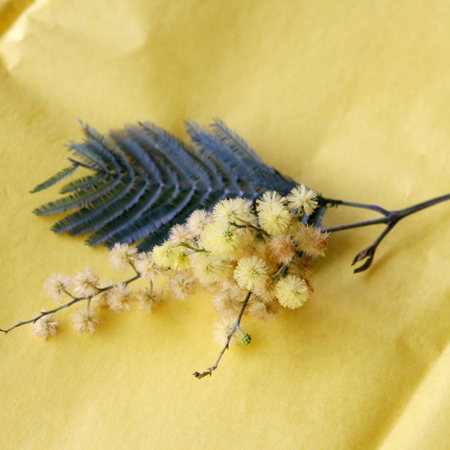 Only later did I realize that the mimosa in perfumes refers to the tree with the fuzzy yellow flowers and a much more floral smell. So I’m really glad that you put a photo of the true mimosa flower and leaf in your post. Champ Elysees sounds really good, Undina. Yeah, what’s not to like about bright, loud and cheerful? Whereas Une Fleur de Cassie, though none of those things, is beautiful in a more moody and sensual way. Maybe you’ll want to get a travel spray for when you’re in that kind of mood too. (Aren’t I helpful?) :) Thank you for the kind words and link to my review. Even though mimosa, especially the leaves, on the first picture (and the one with which Rusty plays on the second) is really close to the one I remember (though flowers were smaller), the second twig (click on the picture to see it better) also had a similar scent even though I’ve never seen such leaves on “my” mimosa. That is one cute shot of Rusty interacting with the twigs!!! He should be in films, he is so amenable to posing! My abiding memories of mimosa are from Mardi Gras celebrations in Nice, when I lived for a year on the Riviera – there the flower blooms relatively early. I will be honest and say I don’t believe I have smelt the whole twig, so I associate the note with a light, bright, sherbety lemon scent. Mimosa pour Moi is my reference mimosa scent – of the type I mean and know, I mean – while the newish AG Le Mimosa was a mishmash that went dead and lifeless on me. Maybe because there was more in it than cheerful flowers? It is an interesting topic. It has also reminded me to dig out my minis of Champs Elysees – I have two and rarely reach for them for some reason. Another good example of the note is YSL Cinema – specifically the EDT – but it is rare as hen’s teeth! I’m not sure I’ve tried Cinema EdT. I liked EdP version and for a while planned to get it into my collection… But then it disappeared from stores and I started doubting my recollection of it. So now I don’t know if I still like it. If I get a chance, I’ll try it. Rusty is very predictable: whatever new thing comes into his line-of-sight you can be sure he’ll investigate: he’ll sniff it, touch it and with a high brobability even try to eat it. So when I want him in a picture, all I need to do is to place perfumes/flowers/etc. where he can reach them easily. Undina, I could send you some Cinema EdT – I have a full bottle. The only problem is my bottle is from 2005, just after it first came out, and long before I fell down the perfume wormhole. It’s been stored boxless on my dresser, and I personally feel the topnotes have gone *slightly* off in my bottle. But it’s still nice. Well, the search shell go on! :) But still thank you for the effort. A blogo-friend sent me recently one more sample of Mimosa por Moi so I plan to test it more this year. I think my perception of perfumes has evolved since I tried it last time so I’m curious to try it again. Glad you liked Tiare Mimosa, Undina! I think it is a nice fragrance. But interestingly, it plays a second violin for me as well. When I smelled Frangipani by OJ, I liked it better. Will have to try CdE in parfum now……. Did you mean OJ’s Tiare? Not that I do not like Frangipani, I was just thinking about comparing Tiare Mimosa to OJ’s Tiare since it’s the same flower (tiare). And Champs Elysees does “mimosa” part better than Tiare Mimosa. Since both are from Guerlain, they are similar but CE, for me, is even more interesting. Rusty is adorable (and photogenic)! Every time I see his photos, I melt. I also love mimosa, but I gave up on finding a realistic rendition in a perfume form. Mimosa Pour Moi is the closest to smelling mimosa on a branch, but it lasts but for a few minutes on me. I keep wanting to revisit it though. On the other hand, L’Artisan Mimosa candle is wonderful. And you drew me in with that Master and Margarita quote. I always imagined her carrying chrysanthemums for some reason. I had that quote in my head forever but I realized that it was probably mimosa only when I re-read my own last year’s post about mimosa while writing this one. Those definitely couldn’t be chrysanthemums because chrysanthemums were mid-summer/autumn flowers in the USSR, there wasn’t a spring variety (I’m not sure if it even exists). Other possible choices would be narcissus (daffodils) or tulips but I don’t remember yellow variety of the former being available there at all and of the latter being too popular and, again, available. Though, who knows which flowers were popular/available in Moscow 80 years ago? Mimosa makes perfect sense, since it was spring, and it was always very popular around that time of year. I love this time of year, because all the trees are starting to bloom and I can remind myself of their smells and notice them when I’m walking. Your post made me happy by reminding me that it’s almost summer and there is still more blooming to come. Funny, I have not paid much attention to mimosa as a note in perfume or nature. I will have to remedy this if I can. As somebody who likes La Tulipe, you will find some of the mimosa-centric perfumes quite enjoyable – I’m sure. I’m very curious to try Opus III now… for some reason I didn’t realize that had a mimosa note. I like Opus III but I think you have to be in a right mood (i.e. 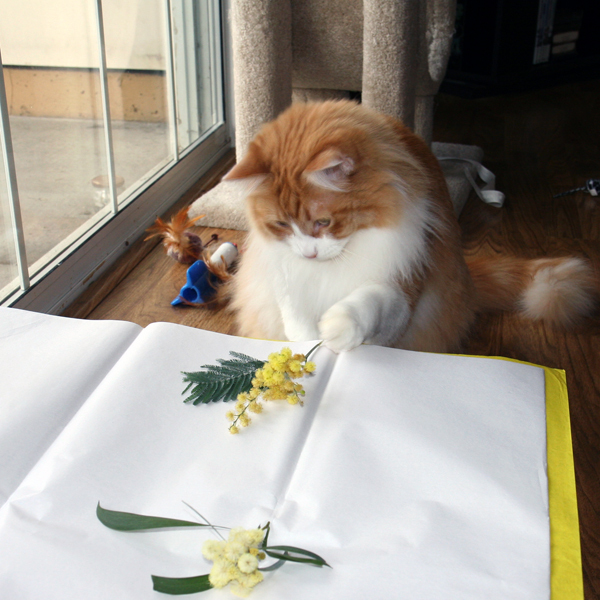 testing mimosa perfumes) or to have a very sensitive nose to actually smell mimosa in there. But it’s a nice perfume even without being The One in my search for the perfect mimosa. Mimosa has a heavenly scent but I have still to find a perfume that captures the sweet, animalic ribbon of scent that comes straight from the tree. It seems that it’s a much harder task to find a perfume that realistically renders those natural scents we know and love. Well, as Victoria said above, the search is a fun part.